Venture into the world of Gutzon Borglum, the sculptor of Mount Rushmore, from the blasting of the stone to the grandeur of the "Seated Lincoln." On the tour you will meet the artist, his family and the famous people who were his friends. Stand alongside the full-sized eye of Lincoln, an exact replica of the eye on the mountain. Step back in time as our exclusive film takes you and Borglum to the top of the monument on the cable car. Discover what motivated Gutzon Borglum and why he began at age 60 what men half his age wouldn't attempt. Gutzon Borglum was an American artist and sculptor famous for creating Mt. Rushmore, a carving on Stone Mountain near Atlanta and much more. He was born in 1867 in St. Charles, Idaho. He graduated from Harvard Technical College. 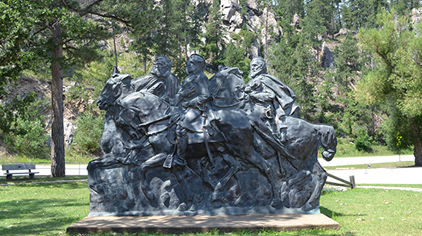 In 1908, Borglum won a competition for a statue of the Civil War Genearl Philip Sheridan to be placed in Sheridan Circle in Washington, D.C. At the unveiling of this sculpture, President Theodore Roosevelt declared that it was "first rate". 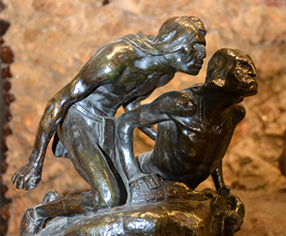 Borglum sculpted numerous statues and pieces that are located all over the world. Stop into the Rushmore Borglum Story to find out more information on all of them! This book was written by Howard and Audrey Shaff. The story of the man who threw himself into life as a painter, sculptor, political crusader, city planner, aviation enthusiast, critic, and sportsman and how it led to its inevitable conclusion at Mt. Rushmore. An exciting tour for the whole family! Venture into the world of Gutzon Borglum, the sculptor of Mount Rushmore, from the blasting of the stone to the grandeur of the "Seated Lincoln." 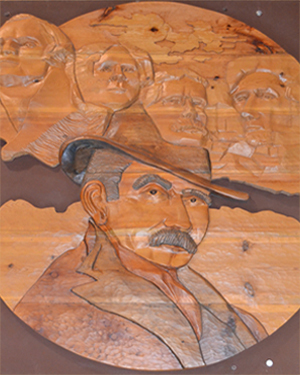 The Borglum Story will enable children and adults to step back and become part of the carving years. This is truly an entertaining, exciting and informative tour for the whole family. Visit the museum to get the full Rushmore experience, and explore his other accomplishments. Discover what motivated Gutzon Borglum - why he began at age 60 what men half his age wouldn't attempt. The Rushmore Borglum Story is open daily from May through early October. Our hours will vary in May, September and October depending on the weather.